Hypericum frondosum is a study in yellows, golds and burgundies starting in November and lasting through December. It's singing its next to the last song for the season. Next to last, because once the hypercolored leaves drop off there will still be peeling bark and hints of new growth. It's a year round beauty that makes Clay and Limestone, well, Clay and Limestone! It just wouldn't be the same with out it! When I planted H frondosum 'Sunburst' twenty years ago, I had no idea that it would revert to species and spread its progeny over the garden. The species is lankier and taller than the cultivar, but, it doesn't matter; the flowers are still beautiful and attract some of my favorite pollinators. Cedarglade St. John's-wort, Hypericum frondosum, Golden St Johswort are a few of its common names. It's as happy in a tamed woodland as it would be in its native oak-hickory-red cedar woodland near a cedar glade. 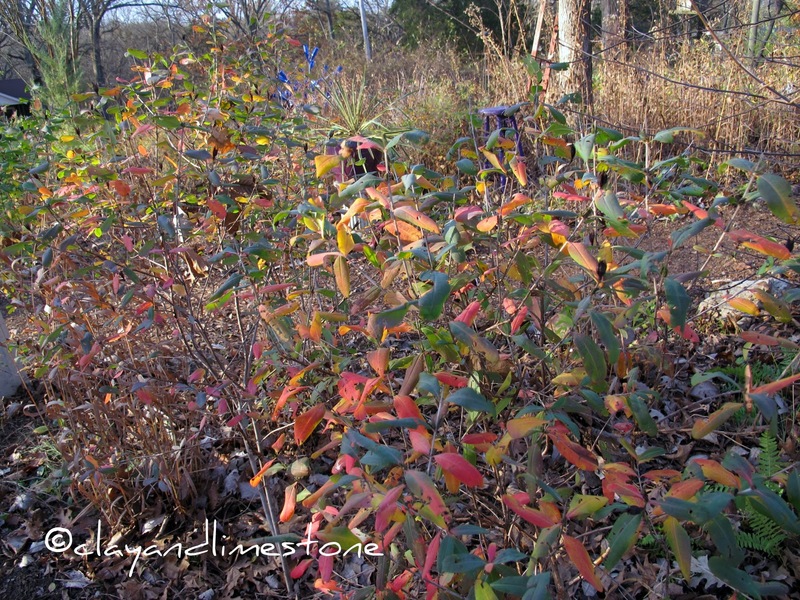 Each fall when I see Cedar Glade St Johnswort's brilliant color I wonder why more American gardeners haven't planted them. They really are good looking four season native shrubs that give good return on your gardening dollar. 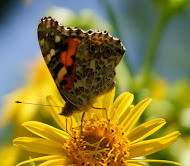 Do your resident Bumblebees, Hoverflies and other pollen loving pollinators a favor and plant a native Hypericum instead of the invasive Euonymous alata/Burning Bush. This one is a beauty. I saw a bee Saturday. Unbelieveable. I love love love love this plant, dear Gail! I have one Sunburst, but have moved it so many times it hasn't had a chance to settle down and multiply. I must dash out and look for seed capsules at once! LOVE those cool seedheads. When it's GOOD to be seedy! I had the same hypericum but it nearly took over a huge chunk of a moist, sunny bed and ended up getting pulled. It was choking out the other plants. I wish I had a spot where it could just ramble, but I don't. Poo! I've had very few seedlings from h. x sunpat. 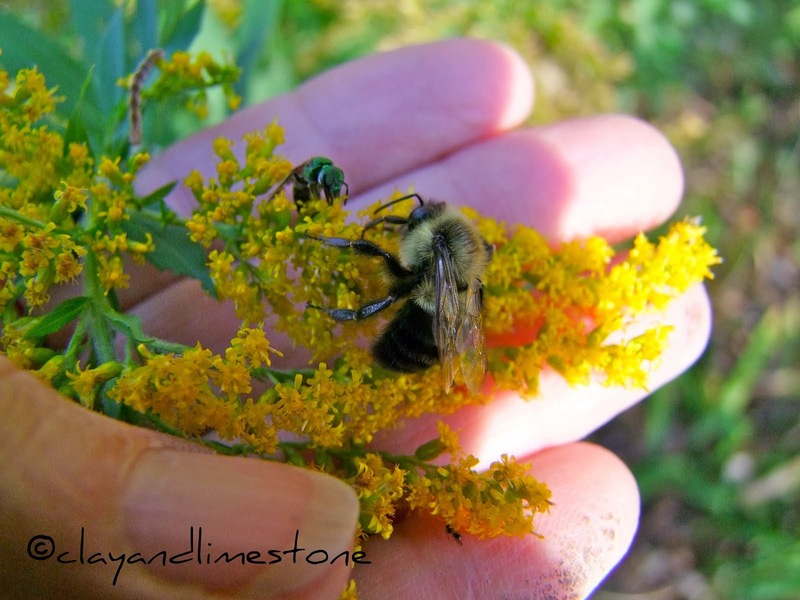 I collected the seedlings this year and transplanted them in spaces where I want the yellow blooms....that the bees find so delightful. I'll have to wait and see if they revert to the species. I must show my hypericums what colour they should be at this tome of year. At the moment they are stubbornly ...green! I too love the plant and speced it for a garden design. The clients did not like it unfortunately because it grew so fast and spread. They did leave it to see how it played with others and it grew on them. I like the color it produces and the interest in the landscape. Wow, i love the many colors in one location, as in the third photo. I would love to see this hypericum in bloom. I'm wondering if it would be medicinal like hypericum perforatum is. It's pretty I'm sure. Mine never does develop the technicolor dreamcoat that yours does but I love it anyway. Yours are glorious! What a lovely show of late fall color! I've been looking at Hypericums in the nurseries for awhile, but haven't planted one yet. Winter will be a good time to think about a place to plant one. I'm so glad to have found your blog! Ever since I attended the Central South Native Plant Conference, I’ve committed to using lots more natives. Bee-autiful! The color in the last shot is stunning! If that doesn't convince someone to plant it, I don't know what would! Love those fall colors! Great! What fabulous color! Great 'plant this and not that' suggestion. Stunning seed pods . . . every inch of this plant is a winner . . . as seen through your eyes dear Gail. i like hypericum, too. mine is semi-evergreen (i believe it's H. calycinum)and i adore the shape and blue-green of the leaves, but it has only bloomed once or twice in a dozen years. i need to try a few more species. the fall color of yours is especially nice. Oh I agree what wonderful color. We live here in the Nashville area and I have seen these but didn't know what they were called. Oh, Gail. it is lovely! I have seen it in native plant books in its flowering state and had no idea that it's so gorgeous in the fall and winter! Thanks for sharing.